After concelebrating Mass and meeting briefly with Pope Francis earlier in the week, University of Notre Dame President Rev. John I. Jenkins, C.S.C., met with Archbishop Paul Gallagher, secretary for relations with states, the Vatican’s foreign minister, and discussed challenges and opportunities for the Church in countries around the world. Father Jenkins took the opportunity to describe the new Keough School of Global Affairs, with its focus on integral human development. They spoke about the University’s work in China and in Bangladesh, where Notre Dame and the Congregation of Holy Cross have been actively engaged for over 150 years. 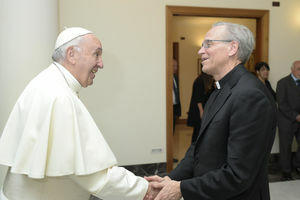 They discussed ways in which “Notre Dame can be of service to the Church in various parts of the world in which the University is present,” Father Jenkins said. In a meeting with Cardinal Giuseppe Versaldi, prefect of the Congregation for Catholic Education, the two discussed how Catholic education around the world at all levels is seen to have a particular strength in instruction in humanistic values. Those in secular education and in other religious traditions come to the congregation to learn how they can bring a similar emphasis to their educational systems. Cardinal Versaldi mentioned that he was visited recently by Muslim educators from Iraq to discuss with him the challenges they were facing in that war-torn country. “It just goes to show the value and power of education that develops, builds on and cherishes humanistic values,” Father Jenkins said. The history and future of the Tantur Ecumenical Institute in Jerusalem were discussed by Father Jenkins and Bishop Brian Farrell, L.C., secretary of the Pontifical Council for Promoting Christian Unity. They discussed the recent visit of Rev. Martin Junge, head of the Lutheran World Federation, to Notre Dame for Commencement and possibilities for discussion with that body. Bishop Farrell spoke at length about applying “the purification of memory” to discuss the history of disputing parties in ways to bring healing, rather than to deepen divisions. “Tantur’s mission is to reconcile and bring peace,” Bishop Farrell said. “Therefore anybody who is willing to sit down and talk would be welcome at Tantur,” including Palestinians and Israelis. Upon entering the Vatican Library on Wednesday (June 14), Father Jenkins encountered a Notre Dame graduate student working on a manuscript there — a perfect prelude for his meeting with Archbishop Jean-Louis Brugues, O.P., archivist and librarian of the Holy Roman Church, to discuss Notre Dame’s ongoing collaboration with the Vatican Library on a number of Notre Dame-led research projects, including one on Byzantine manuscripts and another on art in the Vatican. Archbishop Brugues expressed interest in collaborating with Notre Dame not only to appreciate the heritage of Christian culture, but also to explore opportunities for the future among scholars and artists. On Tuesday (June 13), Father Jenkins joined 20 other priests in concelebrating Mass with Pope Francis at Casa Santa Marta, the chapel inside of the hostel on Vatican grounds where the pope resides. The two spoke briefly after Mass, and before Father Jenkins met with Cardinal Kevin Farrell, prefect of the Dicastery for Laity, Family and Life, to discuss the critical issues of his dicastery and the pope’s pending visit to Dublin during the World Meeting of Families in August 2018. Pope Francis said Mass in the chapel of the Casa Santa Marta on Tuesday morning with the members of the C-9 group of Cardinal-advisors who are working to reform the Church’s central governing apparatus. Father Jenkins had been invited by Cardinal Oscar Rodriguez Maradiaga of Honduras, one of the C-9 group, to join the pope in concelebrating the Mass. In remarks following the Readings of the Day, the Holy Father focused on Christ’s call to all the faithful to be salt and light in and for the world. Pope Francis began by stressing that the proclamation of the Gospel is “decisive” — that there are no “shades” to saying “yes” or “no” to the Gospel. Any attempt to offer a “nuanced” response to the Gospel will “lead you to seek artificial safety,” as is the case with “casuistry." Originally published by Notre Dame News at news.nd.edu on June 15, 2017. Photo provided by the Vatican.